It was an honour being asked by Lynda Jones to share her spotlight as Featured Artist at our Old Courthouse Gallery here in my city of Kamloops, British Columbia, Canada. Lynda is a potter whose studio is in Falkland, B. C.– a potter of ever-increasing recognition, most notably for her astonishingly beautiful smoke-fired pottery which can be seen in more detail here: http://www.okanaganpotters.ca/ljonesgallery.html. Our Opening on May 1st came off well even though the wall socket we’d plugged the coffee and tea into was busted and we didn’t know until we were due to serve it. But once extension cords were found, a good time was had by all. Old Courthouse Gallery, Kamloops, B. C.
That same day, a quarterly magazine, ‘Currents’ published this very generous feature . . . Publicity like this is very helpful and makes it all the more necessary for me to remember that watercolour is my hobby, and a medium I struggle mightily with. All I can hope for is the chance to keep learning from my continual mistakes, while trying to improve in incremental steps. Yesterday I was very happy to learn that the owner of the ‘Dr. M. S. Wade House’ (see ‘previous entries’ below) is very taken with my rendition of her home. She’s lived in it for more than 35 years and rues the day she’ll ever have to move out–but says if and when she does, she’ll now have my painting to bring back the memories. And as a painter, it just doesn’t get any better than that! I am very happy to read of your show, Lance, and the write up looks good, from what I can see. Wishing you continued success! you’re very sweet kofegeek, thank you! Thank you Kim! And what a wonderful Open House/Studio Event you held! 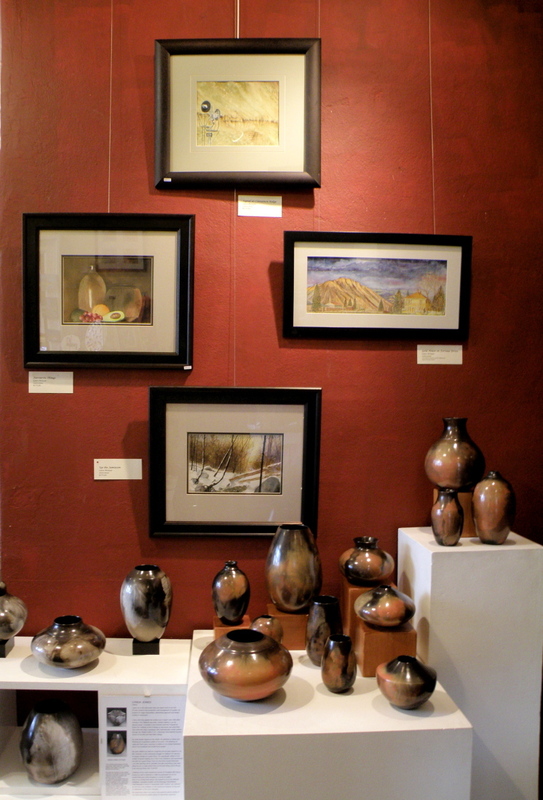 Lance – the pottery and paintings are so complimentary – what a great display. Congratulations on the article – and for those kind words from the owner of that home. A big smile all the way around. Kind and encouraging, as always. Thank you! The exhibition looks fab – well done! And a big WOW for the magazine spread, I think the work featured is stunning and you are far too modest! Thank you for stopping by, and especially for your encouraging words. I love the b&w installation. Very kind of you to say this Pablo–I also enjoy your photography very much! You deserve the best, your work is amazing! Congratulations on your show and the good feedback you received. Thank you very much, Lloyd–thank you for taking the time! Congratulations on all of your successes. Sounds liek you had a great show. How very kind, Francina, and thank you for visiting and giving me your words of encouragement. Congratulation with the article, Lance! I’m happy for you to get portrayed in such lovely way in the magazine. Very well deserved. Your paintings and Mrs Jones’s pottery go well together in colour and style. Very pretty pottery as well. Thank you Michelle, so much. That’s the painting the home owner loves so much–she was actually tearing-up over the phone, telling me if/when she has to leave the house (she’s in her 70s) she’ll at least have this painting. It was very moving. And yes, it reminds me a lot of the American homestead-style home. I love this house and have many photos from which to work. It is usually surrounded by crows, because she loves feeding them! Congrats! I love the painting in the upper right of the magazine! Reminds me of the houses up in Virginia City (just outside of Reno). You always bring a smile Nonoy! Thank you many times for being so kind to me. Lorilei, I appreciate your stopping by to make me feel even better–thank you very much. I love how we both call the same medium home. How often I wish I could paint as you do. Thank you so very much, Lynn–your words here, and on your blog are exquisitely chosen to bring deep smiles! I appreciate the encouragement, Pauline, and am letting you know that now the dust has cleared after the show (I had to get three paintings done in a short time), I am beginning your Robin and will get it off to St. Shotts tomorrow. You are very effusive, Russell, and thank you for always being so supportive! I am VERY happy the opening is overwith, and gratified by your visit today and encouraging words. Thank you very much. I am enjoying your pen work and learning of your exercizes with different nibs. Near Gabriola, I think–that’s wonderful, and a great place to have a studio. Thank you for telling me, Darlene! Definitely! If there aren’t windmills in Saskatchewan, there aren’t windmills anywhere! But, you’d have to go looking–these days they’d be relegated to the homesteads of the Prairies. Congratulations on the exhibit and the article! Well-deserved. And what a joy it must be to know your painting of the woman’s home has become a treasured artwork in her collection – a true testimony to your talent! I like the idea of water colours and pottery shown together. Wish I was closer I would pop in and see the show. My daughter is a potter on Mudge Island. You’re very welcome and thank you also for visiting mine. I’m glad you enjoyed the windmills – I would be very interested to visit Canada’s windmills someday. I have some relatives in Saskatoon, I may have to do something about visiting them! Thank you very much for stopping by and leaving these words. I’ve just been admiring your photographs of windmills. They have such a place in our collective memories, regardless of country. Here in Canada, they speak of Great Depression days and the homesteaders. Congratulations! Your work is most worthy of such an exhibition and article – thanks for sharing! Congratulations and bravo! Fantastic work and the greatest of news on the feature. What a gift you have given to the owner of that home! I love your fence painting–your eye for composition is just wonderful, and I appreciate hearing this from you today. Thank you for being so effusive and supportive, George. It was a boost to receive this kind of coverage, when I expected a little corner on one of the back pages. You’ve got me smiling from ear to ear! How lovely, nia, Thank you so much! Thank you, mags, and yes I am both pleased and touched by her response. I appreciate your ongoing encouragement! How very lovely, thank you Doreen. Many many thanks, Victor. I am an admirer of your candid photos of a whole cross-section of humanity from that remarkable vantage point that is your home. There is no place like it on earth and you document it for us daily! Congratulations on all your wonderful news! Your recognition is well deserved. No apologies needed. 😉 I’ve dropped the ball myself a bit lately. Thank you Lemony!!! I am in the middle of completing our little assignment. One more bird to go! And thank you for these lovely comments. Oh orples, thank you and I apologize for being something of a recluse lately. Thank you again for your encouragement, Maenamor. Your postings are ones I treasure. You take me to new worlds each time. 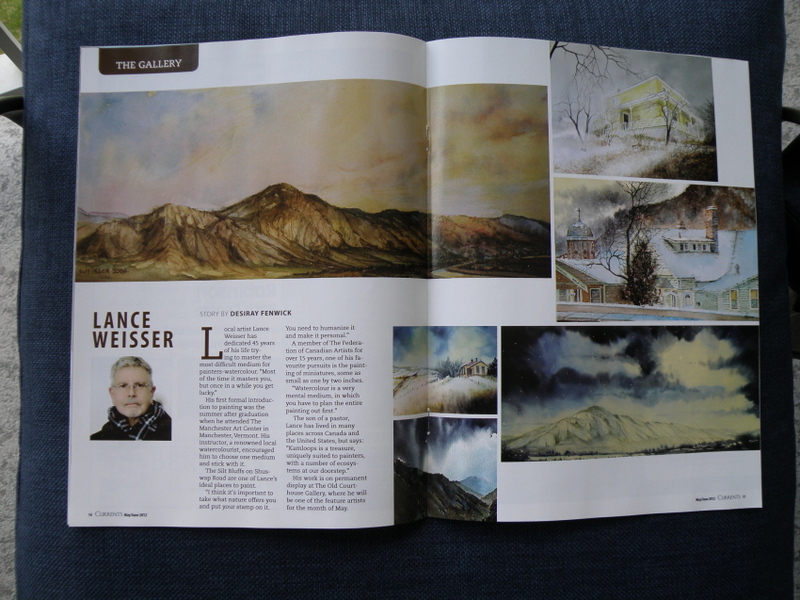 Congratulations Lance on both the show and the article – very exciting to have a chance to develop a bigger audience and share your creative work with others! Love the story about the owner of the Wade house – art at its personal best. Very impressive feature article. So cool. Congratulations! 🙂 You should be very proud of your accomplishments. Congratulations, Lance! It sounds like you had a great opening. This combined with the Currents Magazine feature and the lovely comment from the homeowner about your painting of her house is all so wonderful to hear. Thank you for sharing this with all of us! Congratulation. It must indeed be very wonderful to have someone admire your work and to say that it will always evoke memories. To me it is a big thing to be well regarded and to be exhibited. Your talent deserves the recognition. All the best. Congratulations! Beautiful post! Nice for both of you to show your creativity together in such a forum! I like the pottery as I have a collection of nice pieces. I’m glad your exhibit was successful, as well as the article in Currents magazine. The cream of the crop rises to the top! I see that your art exhibit was a success! Congratulations Lance! thank you very much, Jenny. All the best to you! Congratulation to your successful exhibit..